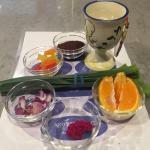 Additional symbolic foods arranged on a second seder plate. . . .
Tonight we gather together to celebrate Passover, our holiday of freedom. We will eat a great meal together, enjoy four glasses (at least!) of wine, and tell the story of our ancestors’ liberation from slavery in Egypt. We welcome our friends and family members from other . . .